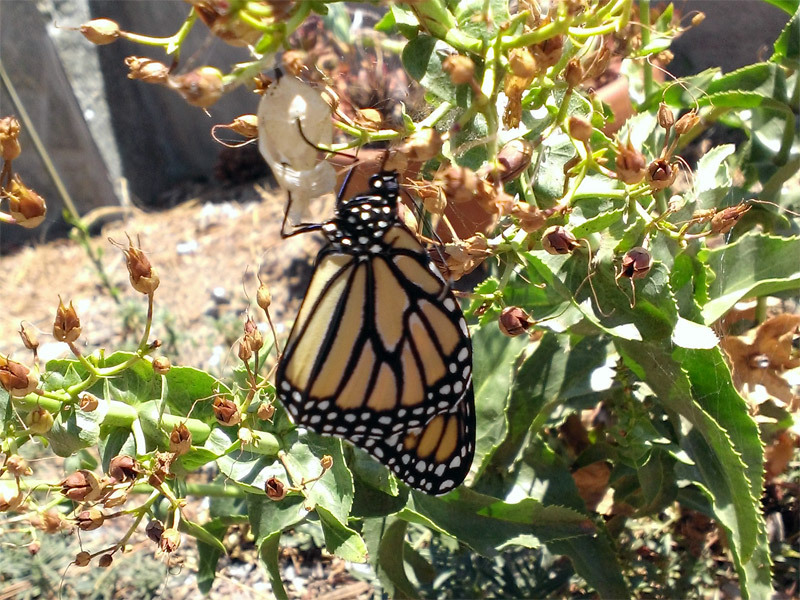 This was the big big day — eight new butterflies entered this world from my little garden! 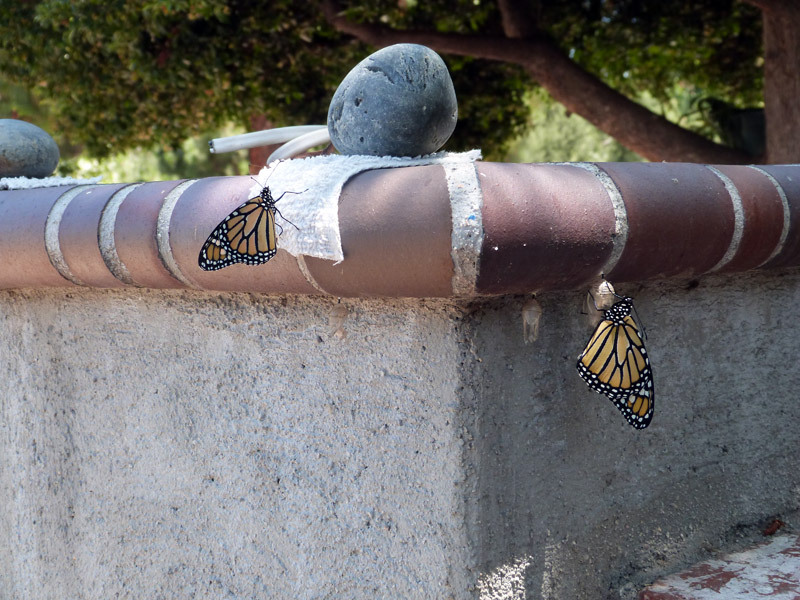 The first two out were numbers 8 and 10, on the wall post. 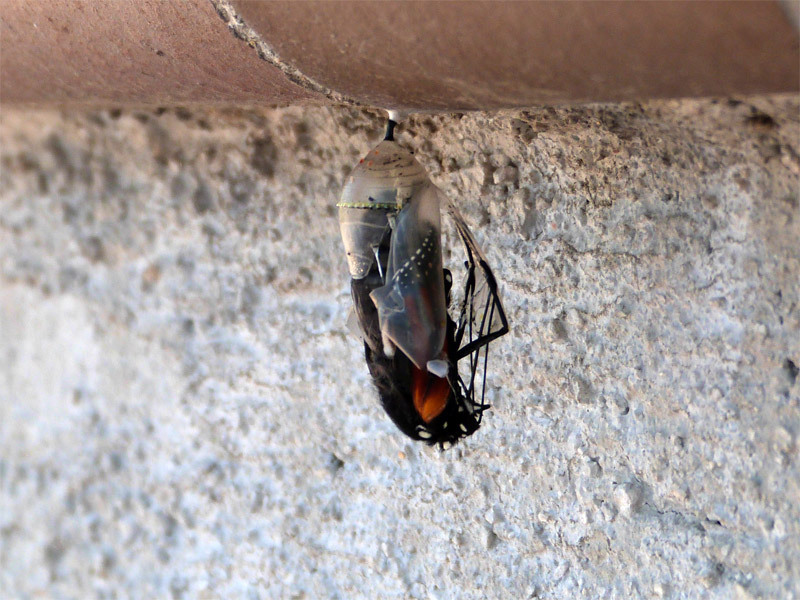 That’s #8 in front, and #10 in the rear, just emerging, behind the chrysalis of #9, which hasn’t opened yet. I believe these are all females. The next one, finally, was #9. By this time, nos. 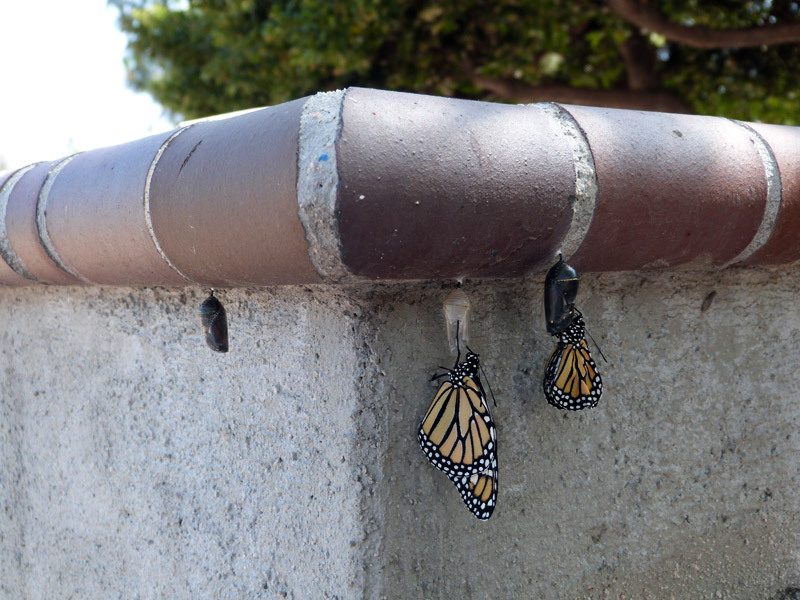 8 and 10 had climbed up on the top of the wall post. 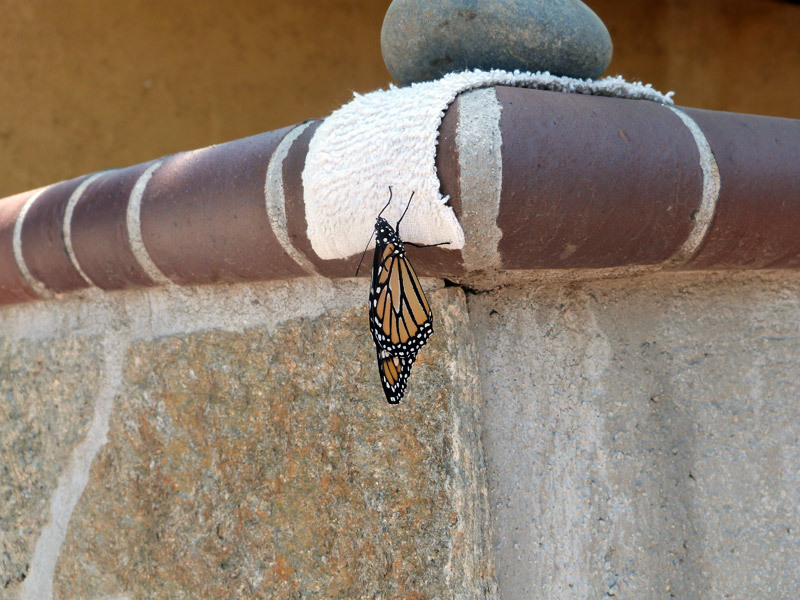 By this time I had noticed a couple of the butterflies having trouble climbing onto the side of the brick, so I hastily put up some terrycloth. Here’s #7 making use of it (I think nos. 8 and 10 have already flown the coop). 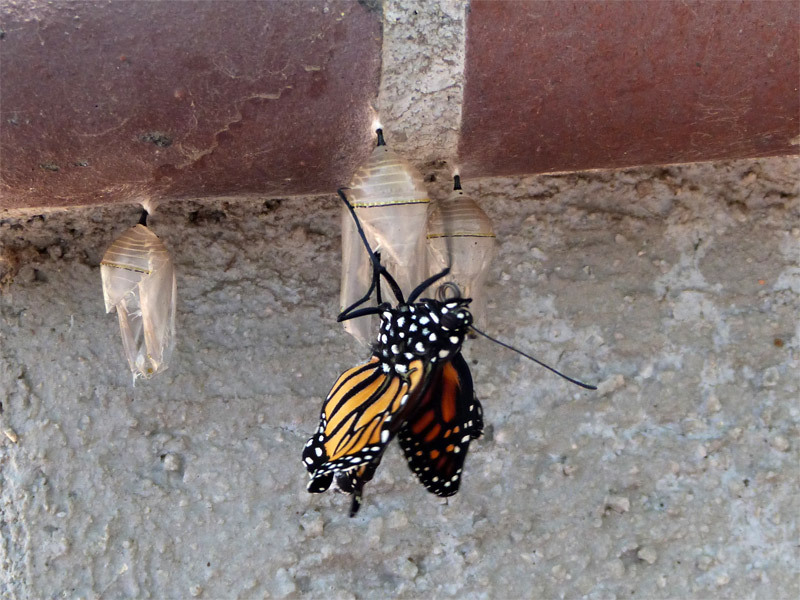 This picture also answers the question “Do smaller chrysalises produce smaller butterflies?” The answer is yes! 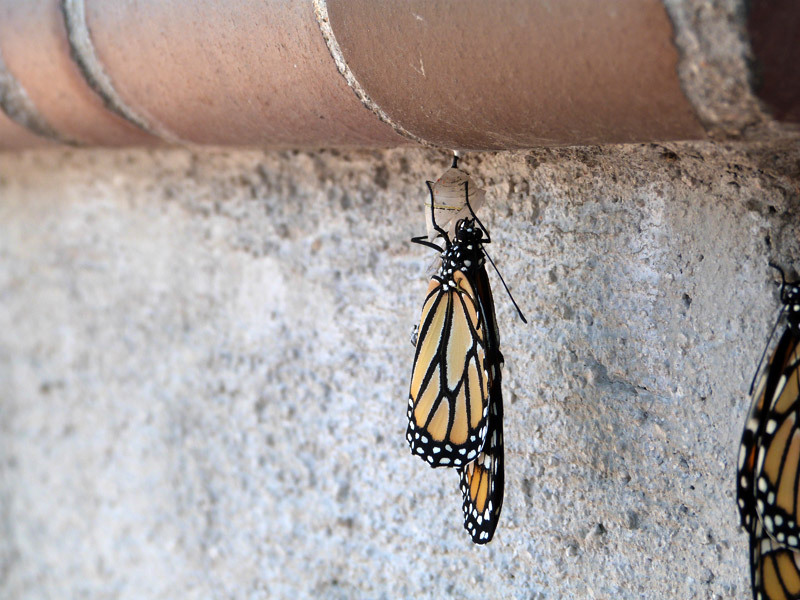 After a resting period of some hours, she finally flew off and seemed fine. Following these creatures was exhausting on this day, but I was thrilled that there were no major mishaps, and they all went on their way apparently successfully. 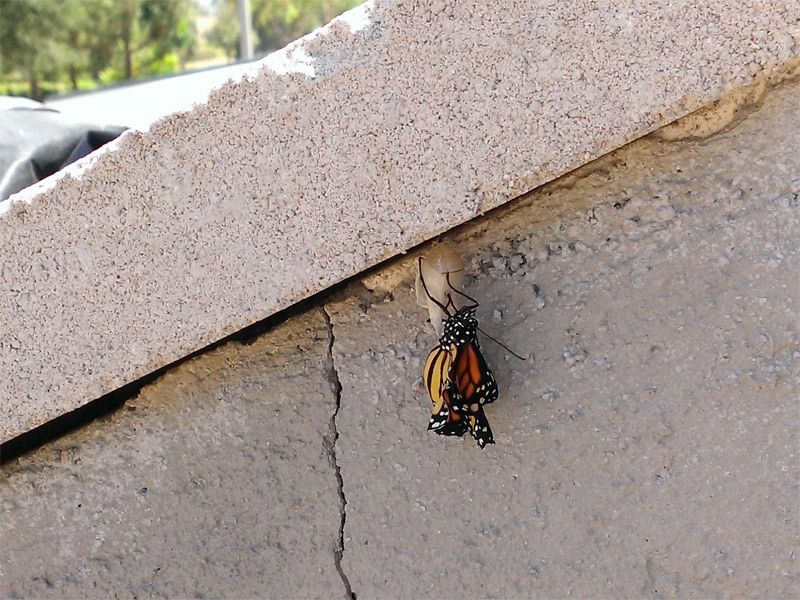 It’s worth noting that for the next couple of weeks, and to this day, I have seen many Monarchs flitting around my yard, and even laying more eggs! I suspect most of them are from this batch. Mazel Tov to all of them! 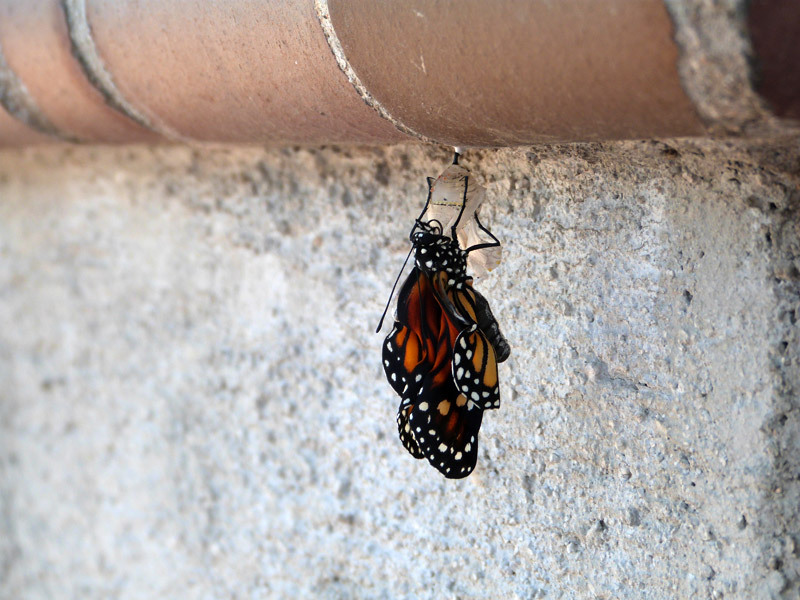 This entry was posted on August 17, 2013 at 2:18 pm and is filed under Butterflies, Updates. You can follow any responses to this entry through the RSS 2.0 feed. You can leave a response, or trackback from your own site. What a wonderful post! 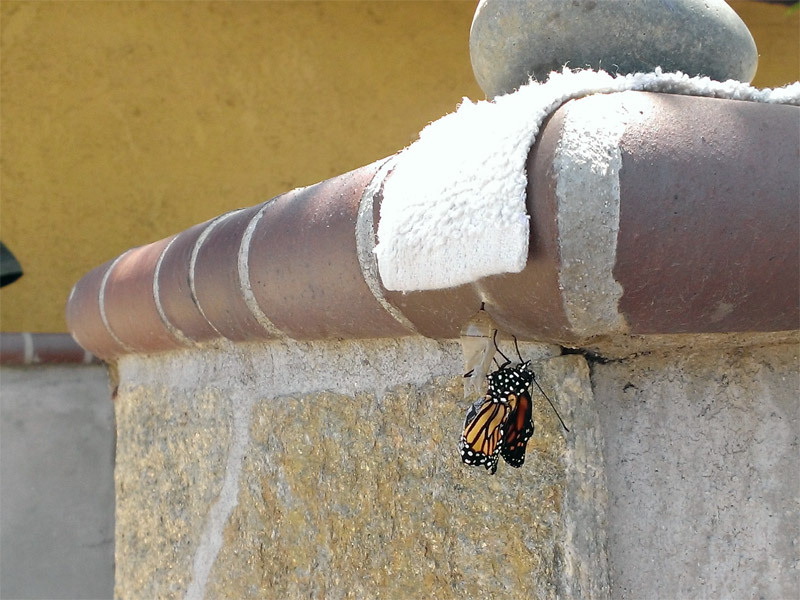 I really enjoy all the details, particularly the step-by-step photos of the butterflies pupating. 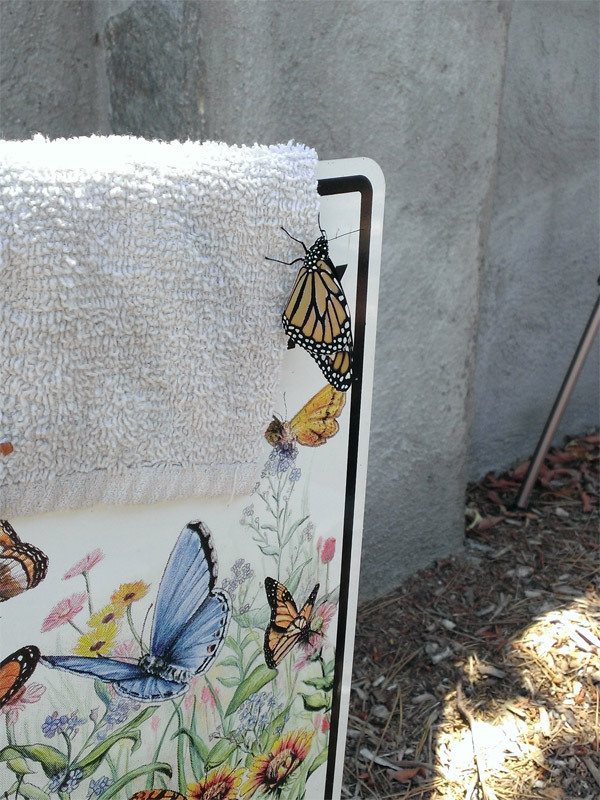 I also like the idea of using terrycloth so the butterflies have something to cling to. 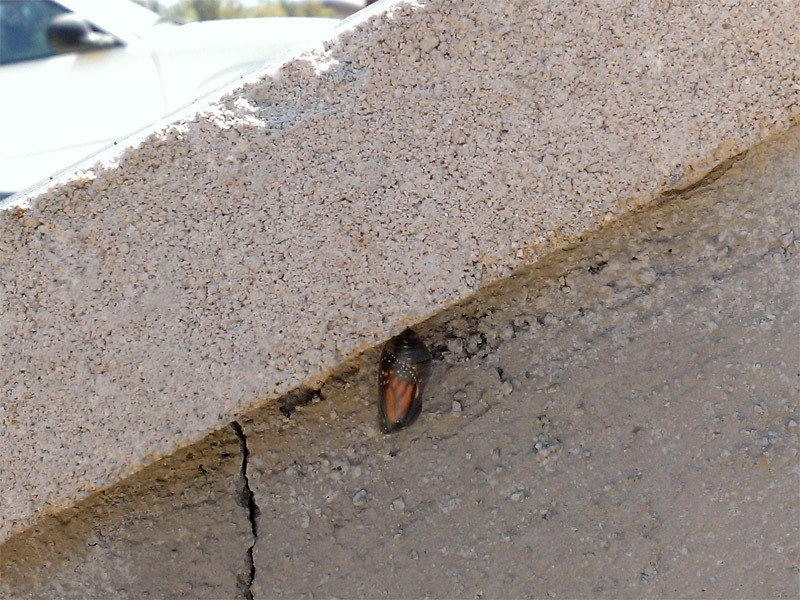 Hey, I’ve know some people who bring the eggs and/or larva inside and feed them until they pupate. 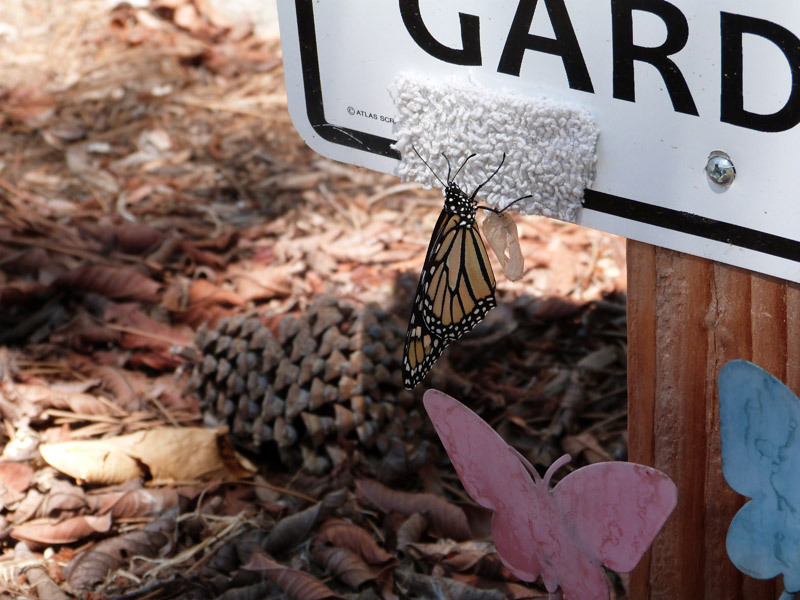 It helps protect the larva from hungry birds. Have you ever tried this? I’m just wondering what people are and aren’t doing that’s successful. 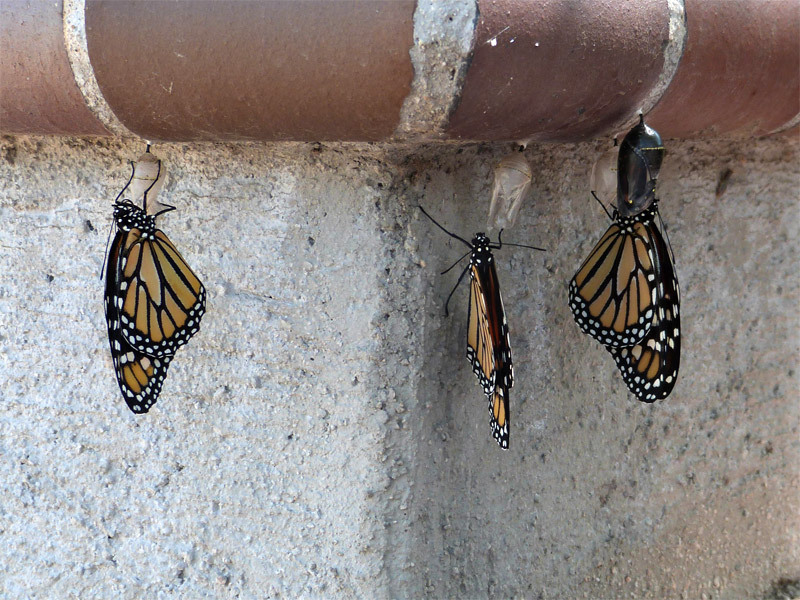 Obviously your Monarchs are doing very well. Congratulations! Nice pictures, Cynthia, and surely took a lot of time and work. Thank you all! 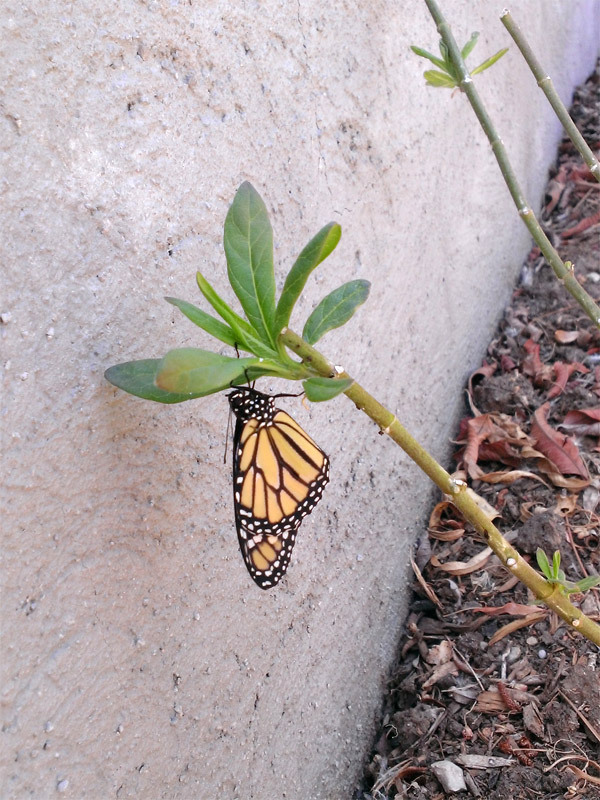 Debbie, I have considered “raising” Monarchs indoors the way some people do, but it seems way too labor-intensive for me, and I guess I just prefer seeing them in their native environment.